Halloween is about 90 minutes from drawing to an official close and I think ours falls squarely in the success column this year. It was 72 sunny degrees today and it's a Friday. Those are both good starts toward a good day. Andrew dressed as a very authentic-looking fighter pilot, complete with real US Air Force patches and his very own name patch as well. (Steph - I haven't forgotten I owe you some $$$.) He LOVED his costume and didn't want to take it off tonight and was delighted when a neighbor recognized him as a Air Force pilot without any prompting. Thomas, who had for weeks insisted he would not be wearing a costume, not only relented and wore the train conductor outfit, but asked to wear it first thing today rather than waiting for the official parade to begin at school. When I left him this morning he was handing tickets from the pocket of his apron out to all his friends and his teacher was making masking tape tracks on the floor so he could conduct the group. That's a far cry from, "I no wear costume. I be TomTom." Grandma, PaRon and Great Grandma stopped by to see them in their outfits this evening and good friends came for dinner, adding to the fun. I took the boys to a few houses for actual trick-or-treating, because the 4 metric tons of candy we have here wasn't enough, I guess, and now everyone is asleep. All in all, a great day. We here at the hondo house need some advice. It's about our two-year-old. The child is a total light of my life and I love him more than words can say. But, in the words our our esteemed pediatrician, he's just a crappy sleeper. He's awake a lot during the night and nine times out of 10 he gets himself back to sleep, but the fact remains that he's restless, he still spins 360s during the night in his bed and he has a nasty habit of waking before the sun. When describing these habits to our doctor and seeking advice she asked questions about our routine for bedtime and finally suggested that we were doing the right things but that if he were her's he would stay in a crib as long as humanly possible. Here's where I need some quick help today. For the past four nights he's begun to mention, at first subtly, now more assertively, that he would like a big boy bed. To which I say, &@*^!#. It started by him wanting to sleep with Andrew. Then he kicked it up a notch and said straight-out that he wanted a big bed. Now he's moved into the mode of salesman and he'll point out the deficiencies of his current sleeping situation. He'll tell me that he, "No know how to get out." Right. That was the plan. (He tells me this while demonstrating from the inside that his leg doesn't reach easily over the rail.) He has also gone so far as to run his hand along the rails from the outside and say, "I no like these." The last important data point here is that he's gotten out of his bed one time. It was months ago and it scared him because he hurt himself, but still. He's done it. I finally told him last night that I would talk to Daddy about it and we would start working on it. His response was, "OK. RIGHT NOW. GO DOWN. TELL DADDY RIGHT NOW." I have some concerns about this request. The first is one of safety. His bedroom is upstairs and ours is down. I believe there to be a high likelihood he'll try to come see us during the night. That concern parlays right into the next, which is, I believe there's a high likelihood he'll try to come see us during the night. I don't really see that we have tons of options. We've got a kid, who is fully capable of escaping his bed should he choose, asking for a big boy bed. I guess it's time. It's just that the last time we did this the kid in question was so ready and we just knew that he wasn't going to wander. This time? Different kid. I need advice. I need opinions and I need suggestions. And, I need them today! He doesn't talk a lot but he's got a good memory and he's consistent. I don't see him giving up on this one and the more frustrated he gets with inaction I'm thinking it's more likely he'll try a Houdini-style escape which would be bad. Thomas is sick. He has double pink eye and a really special little lower GI issue that's floating around his classroom. The conundrum is that he's not allowed at school but is not feeling so much under the weather that he's not wanting to go, go, go. So, we took a brief field trip to Old Navy this morning. Their little boys' collared shirts are on a great sale. He already has one for this winter but they were so inexpensive that I thought I would look through them and choose another for him. The trouble was that he set his heart on the red and navy blue stripe option and I had my heart set on the navy blue and white stripe option. We played a little game for a few minutes in the store where I would put the one I had selected in the stroller and then, when he thought I wasn't looking, he would put that one back and grab a red and navy stripe one instead. We did this three or four times. His fashion sense is consistent. The problem with this trade is that the one he already has at home? You guessed it. It's the red and navy stripe one. No amount of talking could convince him that he already owned it. Even when I reminded him that he HAD WORN IT YESTERDAY. I eventually conceded and let him carry the one he wanted (and already owns) through the store, and I snuck the one I wanted onto the back of the stroller, planning for a switcharoo at the register. So, he carried that shirt around like it was a long-lost treasure for the duration of our stay. He also at some point during the trip latched onto an enormous, lovely royal blue hobo-style, patent leather handbag. It was on sale. Go figure?! 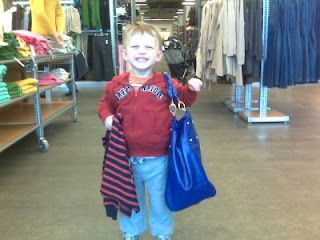 This, my readers, is how my son paraded through Old Navy this morning. Last night was a full moon, which must mean another week has gone by and it's time to post again. Aunt Steph and Wyatt have been visiting this week which means lots of good cousin time, and family time in general. The cousins have discovered that when we're all together even trips to Target are more fun and that eating dinner at Grandma's every night is BIG FUN. It's fun to see how much rice you can spread around Grandma's living room (T) and it's fun to see what kind of reaction you can get from someone your own size by spitting at the dinner table (Wyatt) and it's fun to eat ice cream with caramel at the bar every night post-meal (Andrew.) Good times for everyone. Highlights include the fact that Wyatt will say, as many times a day as I'll respond, "Hi, Aunt Susan!" He says it as if you've just entered the room and you haven't seen him for months, even though you've been sitting next to him for an hour. I love it. Another highlight is that every time we enter Grandma and PaRon's house, Thomas inquires if Wyatt is sleeping and if he's told that he's not, he goes to the top of the stairs and yells down, "Hi, ByWy." Over and over. Tonight Aunt Susan had the brilliant idea that we would bake sugar cookies (the cheater's kind) and then the boys could decorate them with Halloween sprinkes after dinner. Those little black and orange non-pareils sure do roll on shiny, new wood floors. Grandma is going to be finding them as a reminder of that genius activity for weeks to come. We hope that she'll stop and smile, remembering how Wyatt decorated four before taking a single bite but then wanted to eat them all, how Andrew carefully placed each sprinkle and how Thomas took a look at his bowl of decorations and decided it would be infinitely more efficient to just dip the cookie in them as he ate. If she doesn't smile, she'll be cursing me, so let's all pull for it to be a fond memory. 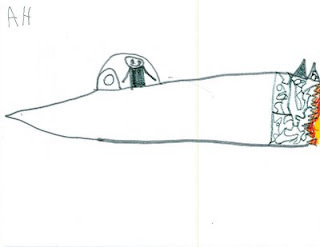 Tonight I leave you with two pieces of Andrew's artwork from this week. 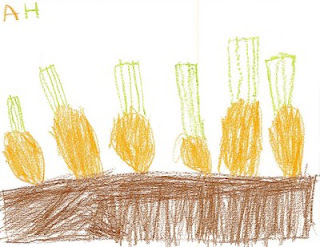 The first is an ode to the pumpkin patch, from which we've been rained out twice in three days. We'll try again tomorrow. The second is an ode to Uncle Jeff. 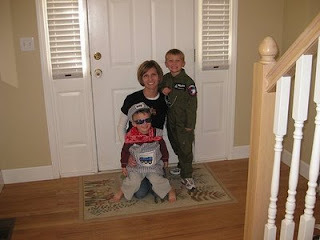 Andrew is going to be a fighter pilot for Halloween and Uncle Jeff sent some of his authentic flight suit patches along with Stephanie for Andrew to borrow so Jeff's status rose even further with him - and we didn't even know it was possible. He specifically asked me to send this picture to Uncle Jeff, but I can't bear to part with the original so I'm posting it here for him to see when he's back from training. I compose an average of 1.78 posts a day in my head for this blog. I also take an average of at least 1.349 photos per day of our kids. I've got video from the weekend of them marching around the house waving Jayhawk flags playing imaginary trombones and trumpets. I've got action photos of Andrew kicking a goal at his last soccer game. I've got shots of Thomas enjoying the game with his buddy, Josie. I've also got video of them performing a little ditty by The Who for us earlier this week. All of those deserve a blog post to go along with them. And yet, I've got nothing for you. When we come home from school and it's beautiful outside we stay there too late. Tonight it was so beautiful that we had a dinner picnic at the playground with our friends. By the time the boys are in bed after an adventure like that there's laundry to be done and depressing financial news to be read and the list of half-crafted posts in my head just keeps piling higher. I also tend to get sidetracked with things like painting the wall behind my refrigerator and obsessing over the weird sounds our non-functioning ice maker is emitting and next thing you know it's 11:30 p.m. and no photos have been downloaded and no posts published. 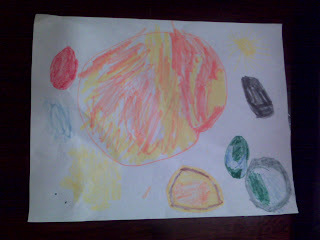 I have, however, learned a lot about the solar system this week as it's the topic de jour in Pre 2. Did you know that scientists now believe that Pluto is not a planet? I thought I was up to speed on this and I was comfortable with my knowledge of this fairly recent status change for our ninth planet. I was of the opinion that Pluto was now accepted to be a dwarf planet. I was corrected today by my little astronomer who says that the newest thinking is that Pluto is one of Neptune's stars. Hmmm. So, I leave you with no photos of our adorable boys and no real posts but instead I've given you something new to Google so we can all fact check Andrew. As a parting gift for your patience with my slowness in posting anything newsworthy I've also photographed Andrew's drawing of our 8-planet system with my phone - because it requires no down or uploading. You'll recognize Jupiter in the middle because it's the biggest planet and you'll recognize Saturn beneath it with the ring around it. Now get to google-ing. You know you can't help yourself.